Study.com is an education website that helps students in kindergarten through college excel academically and working professionals gain the skills they need to advance. 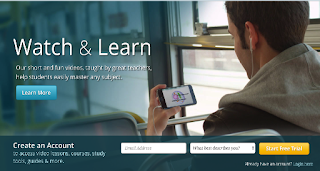 With animated videos, that bring concepts to life, Study.com provides an easy, low-cost way to improve grades, earn college credit and close skill gaps. It also offers over 15,000 short animated video lessons organized in courses covering all major k-12 and college subjects, as well as professional development and certification courses. Students of all ages can learn almost any subject, anytime, anywhere, even on their mobile phone. For k-8 – Study.com provides a fun alternative to textbooks that helps students learn new concepts in 10 minutes or less. For high school – Study.com helps students cram for any subject, prepare for SAT, ACT, AP and other standardized tests, and even earn college credit online. For college – Students can reduce their tuition costs by completing their general Ed requirements online and transferring credit to over 2,000 colleges and universities. For working professionals – Study.com provides a convenient low cost path to a college degree and workplace skills and certifications to advance their career.